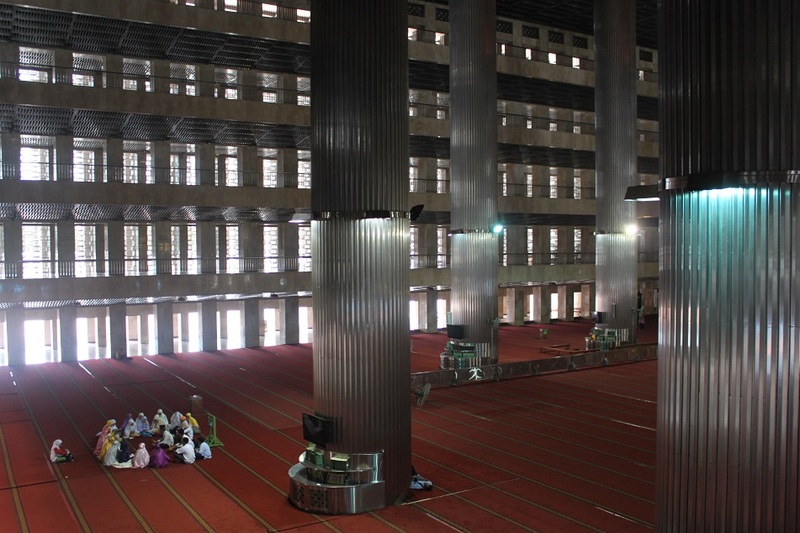 Politics, Religion and Art at Jakarta’s Focal Point | What an Amazing World! Gleaming under the morning sun, a gilded petrified flame sits atop a whitewashed monolith. Emanating from its base, trees cover most of the wide plaza providing shade for visitors – and a few decades ago, deer. 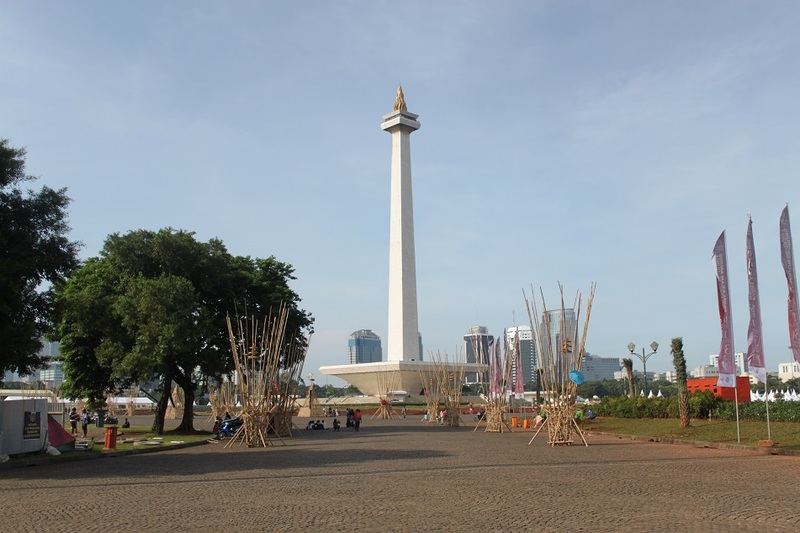 Monumen Nasional – widely known by its acronym, Monas – was a monument commissioned by Indonesia’s first president, Sukarno, to embody the spirit and optimism of the newly independent country. 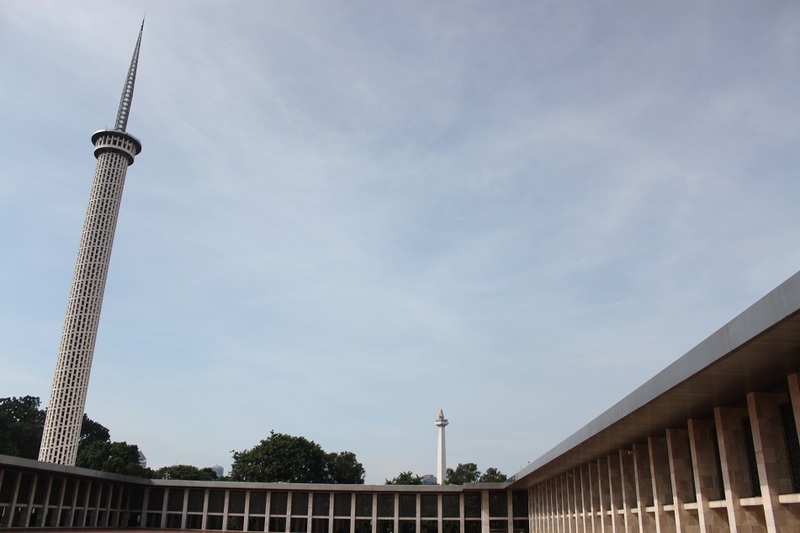 To the north of Monas lies one of the most important buildings in Indonesia’s political landscape: Istana Merdeka (Independence Palace) which is joined by another palace to its back, Istana Negara (State Palace). Together they make up the Presidential Palace complex, the seat of the executive branch of government. Originally built as the office of the Dutch Governor General in the 19th century, the neoclassical palace looks rather modest in size compared to many other presidential palaces around the world. 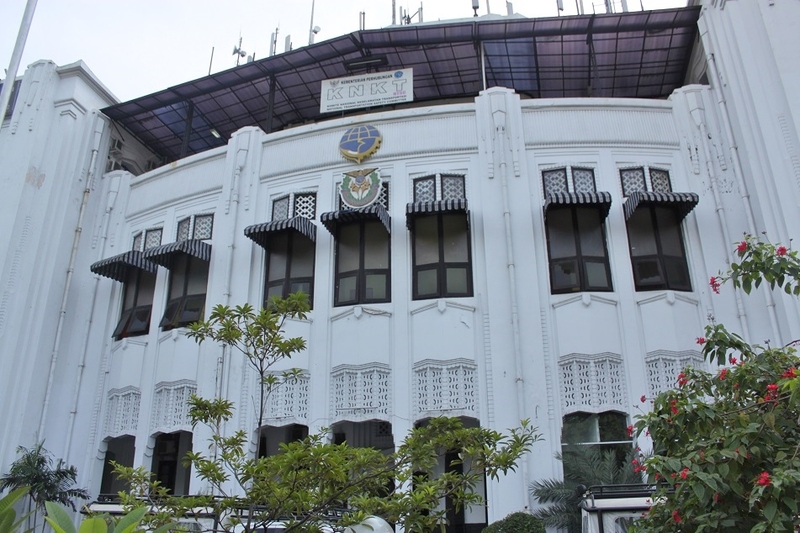 It is even dwarfed by Gedung Sate, the office of the West Java governor in Bandung. 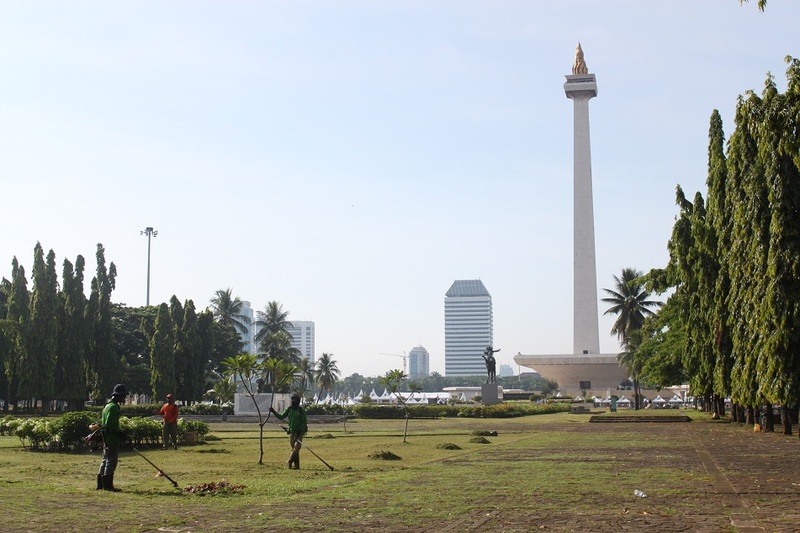 In addition to Istana Merdeka, more than a dozen government ministries’ offices are also located around Monas, reinforcing this area as the focal point not only for the national capital, Jakarta, but also the entire nation. 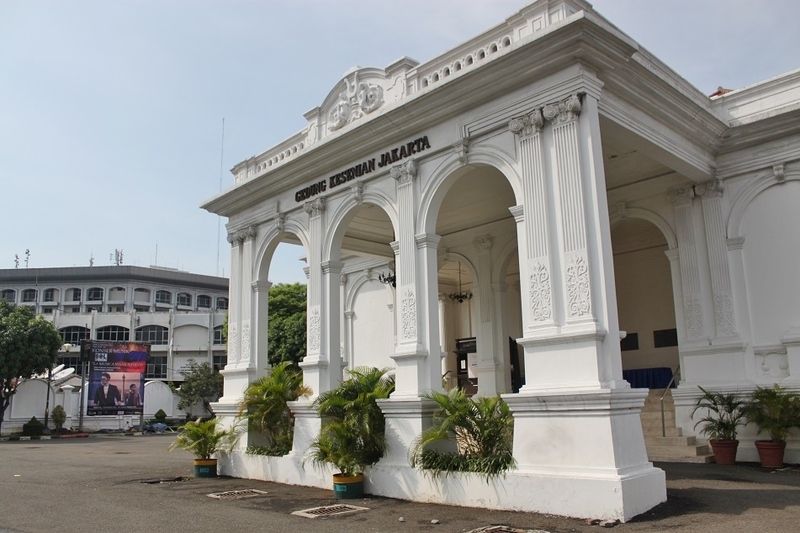 Merdeka Square, as the area is called, became an exclusive precinct of Dutch East Indies government offices in the 18th century when they moved from the more crowded Kota – today better known as Kota Tua (Old Town) – 4 km to the north. Politics aside, the area is also where two of the country’s most important religious buildings reside. 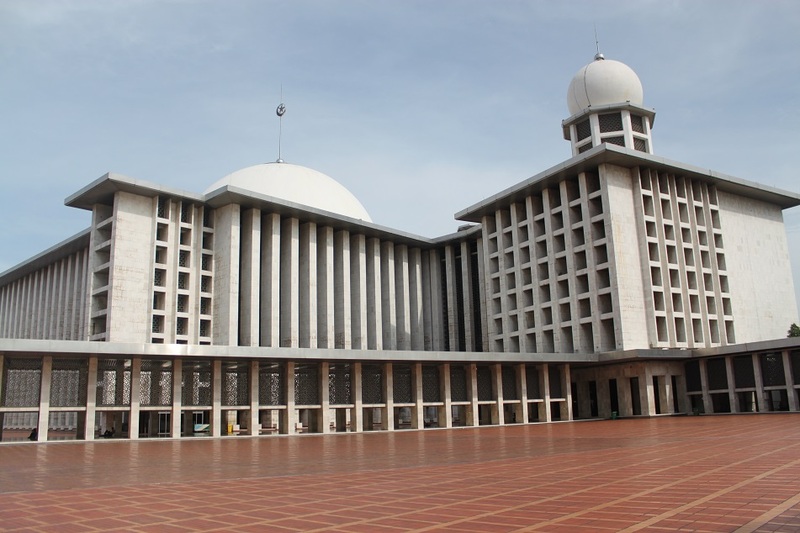 Istiqlal Mosque – Southeast Asia’s largest with a total capacity of 120,000 people – was built over a 17-year period and inaugurated in 1978. 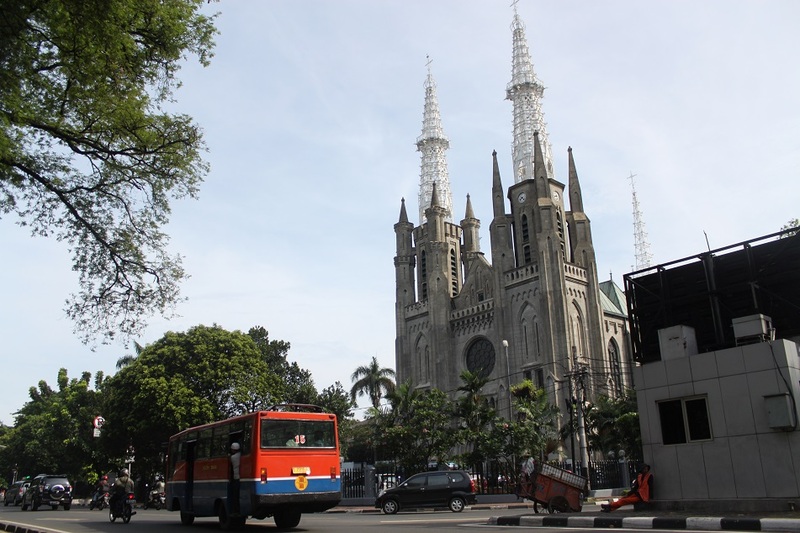 Designed by a Christian architect, the mosque was constructed at Wilhemina Park, right across Jakarta Cathedral which is the seat of the Roman Catholic Archbishop of Jakarta. The two monuments alongside the nearby Protestant Church of Immanuel symbolize the religious harmony to which the country aspires. 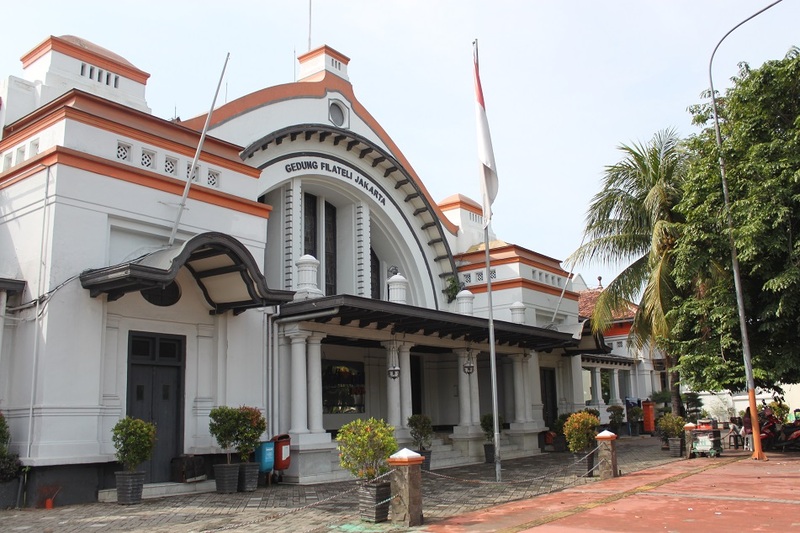 A bit further off the main roads around Merdeka Square are some of Jakarta’s finest Dutch buildings and an oasis for culture and art connoisseurs. 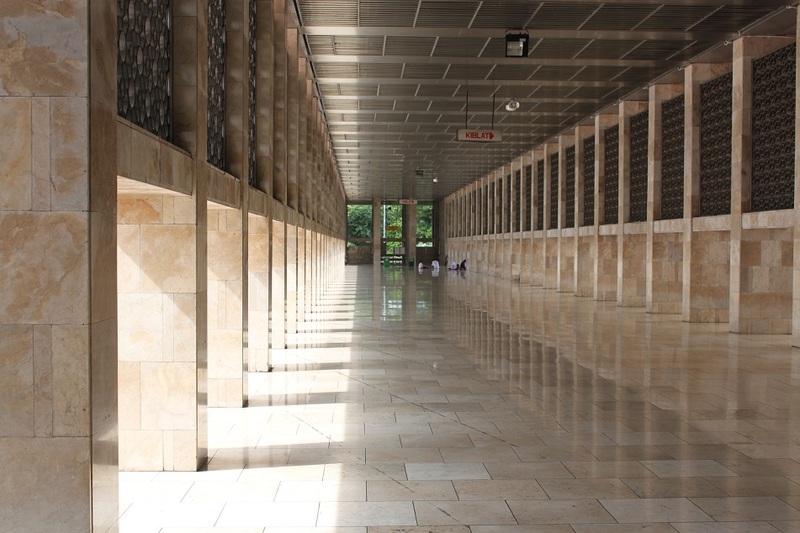 Gedung Kesenian Jakarta (Jakarta Art Building) serves as one of the city’s most prominent theaters with regular performances. Meanwhile Galeri Nasional Indonesia (National Gallery of Indonesia) showcases works by various Indonesian and foreign artists. Amid the exponential growth of malls in the city, a walk around Jakarta’s focal point proves to be not only a nice jaunt, but also necessary to better understand the history which has shaped the face of the country today. 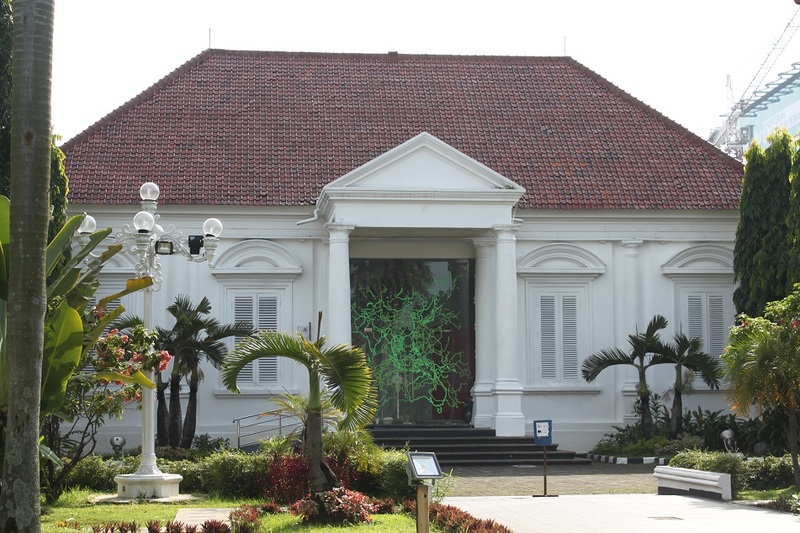 Furthermore, it is here at Merdeka Square where one can learn about Indonesia’s history at Museum Nasional, hosting the richest collections from all corners of the country. Reblogged this on Sunshine Studios Kefalonia. Thanks James! I went at 7 and Jakarta was not as hot and humid as I anticipated. The sidewalk was probably the best and most convenient in Jakarta, very much different from Kemang. 🙂 I was also surprised to find all those well-preserved Dutch buildings. Maybe the next time you come I should take you there. I’m currently living in Jakarta and I love how this photos show how beautiful this city can actually be! What are those inside the national gallery? it looks like a massive plasma globe. 7 am is dedication, but otherwise it will be too hot and full of vehicles. 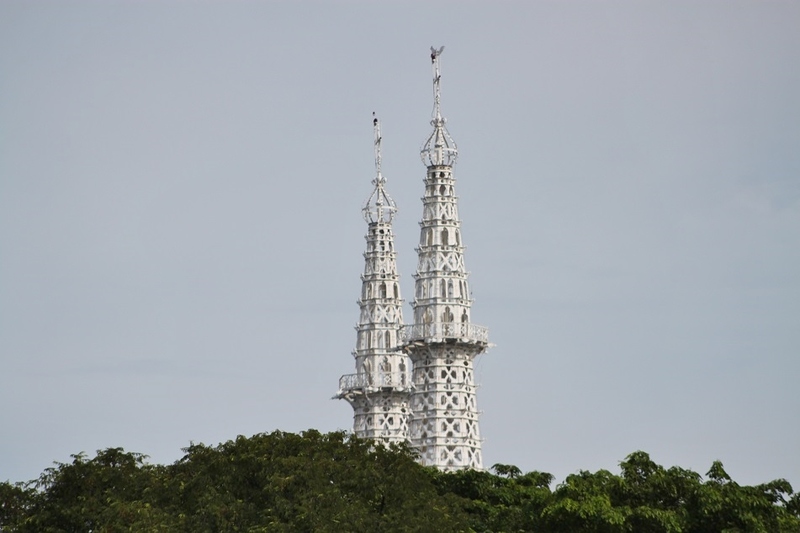 They have vast collections of modern and contemporary works of art, from painting to sculpture. 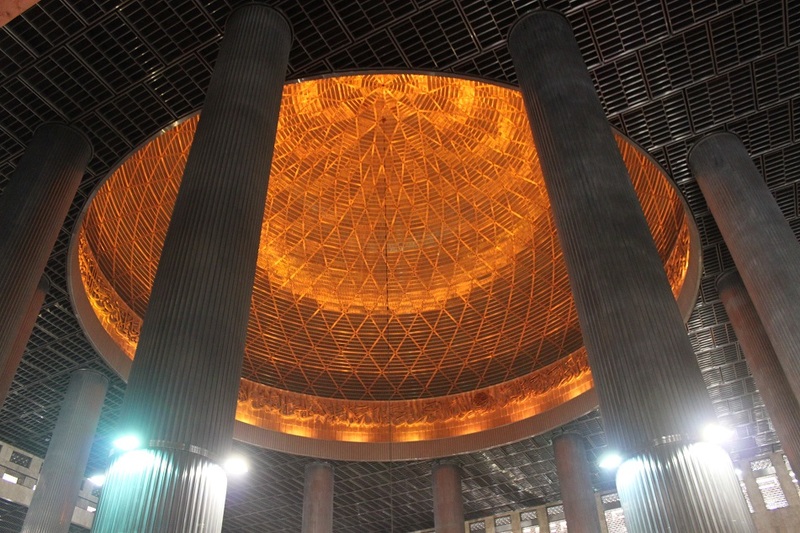 Are you referring to the dome of Istiqlal? It is indeed massive! Standing underneath it would give you a sense of meaninglessness as a human being, like any other worship places would do. No, not in istiqlal its the National gallery there seems to be green lights inside, that is showing on your picture, almost as if there are light sculpture? Oh that’s actually a sticker on the glass entrance door. 🙂 Looking at it again I can see why you thought it’s a light sculpture, because it’s so convincing! ow.. ok.:( it looks very curious. I myself was pleasantly surprised to discover such interesting places at the heart of Jakarta. I’ve been to a few of them, but that was a long time ago when I was a kid. I agree with you about the dome, Meredith. For me, that’s one of the highlights of the mosque. As for its architecture, somehow it reminded me of Soviet-style buildings where functionality often triumphed over aesthetics. It’s no surprise I guess, considering Sukarno was a left-leaning president himself. I think it is truly amazing that you took on this amazing challenge! Truly inspiring! Maybe because you’ve been living there for some time while I usually visit Jakarta for holiday instead ;P It’s not the city I have in mind to live in and settle down at the moment, though. Yes, memang besar dan megah sekali kubahnya Istiqlal. Dengan permainan cahaya bikin keliatan tambah megah. Hi Bama, interesting focal point for a city indeed. I’m particularly impressed with the different religious structures standing side by side with each other; such a great depiction of religious harmony. 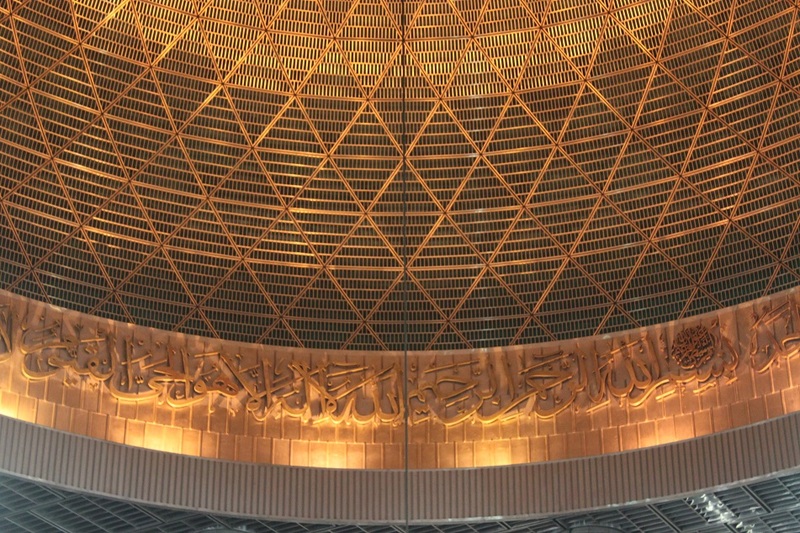 I also found it of interest that a Christian designed that grand mosque, which is my favorite structure of all. It like the modern twist in its desigh and yet the feel is still very traditional. Its dome is breathtaking. Great post! Hi Marisol, that jaunt on a Saturday morning further proved that there are a lot of interesting places in our own cities. All we have to do is do a little bit of research and explore. 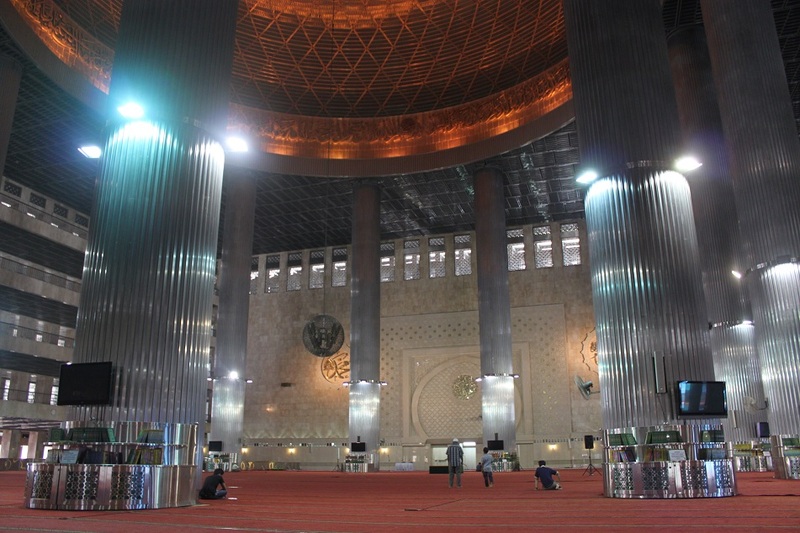 Actually not a lot of people know the fact that Istiqlal Mosque was designed by a Christian, which in my opinion is very important to know. My favorite part is indeed the dome. With a different lighting tone than the rest of the massive building, it’s easily eye-cathing. Thanks Marisol! Indeed. Even though they’re not as ornate as the ones in Europe, but they give a really nice touch to the city’s skyline. Thanks Madhu! I guess the calligraphy band is a nice touch to the rather monotonous and ‘cold’ mega-structure. I’m in Bali now and actually some places reminded me of you and made me imagine how you would love to visit this island one day. 🙂 I’m a little behind blogging this month but after this trip there will be tons of stories to write, both from Bali and East Timor. Bama, your posts are beautiful and very well-written as always. I enjoyed the pictures and the well written account of Jakarta’s politics, religion and art. You’ve truly captured the city’s beauty. I also enjoyed how you provided some background information about the monuments and buildings. I so want to visit the places/countries you’ve written and described in your posts! Reblogged this on Kampus Politeknik NSC Surabaya. Well done getting this collection together. Jakarta rubber-time must have made this an exercise of patience. Hmm you are colonial architecture enthusiast like me! you should’ve included the Department of Finance building, or the ex Daendel’s palace! there are few others in Pasar Baru area but most are forced to coexist with the ugly ruko… Menteng is also very nice place to get a glimpse of the colonial mansions, although they are walled and often closed from public view… there is little protection to the current surviving buildings, which really is a shame. Thanks for the suggestion, Kevin. Is the former palace of Daendels the one at Taman Fatahillah? If so then I actually have visited it several times. If that’s not the one you’re talking about then I’m really intrigued! 🙂 I would love to explore more of Jakarta’s old colonial buildings, and as you said Menteng is another place to go for that reason. 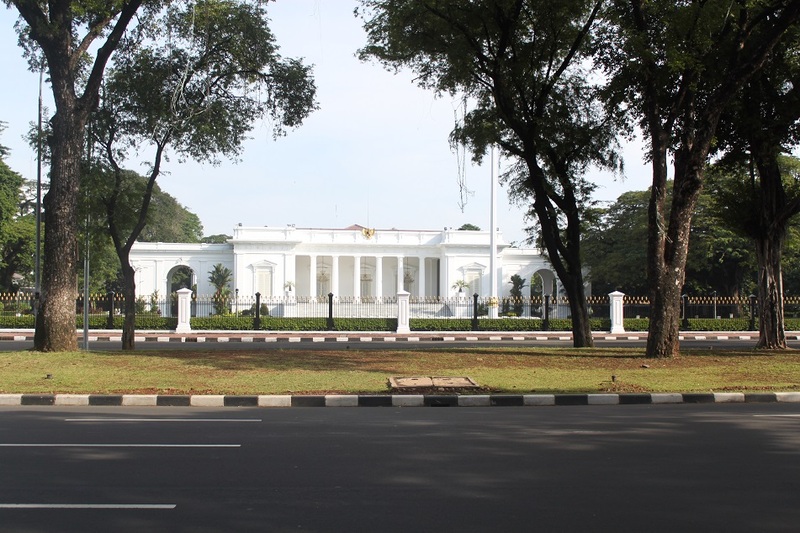 I’ve spotted some beautiful mansions in Menteng every time I happened to drive around that area. But I really should dedicate one morning to explore the neighborhood. Yes Menteng is wonderful on a Sunday morning (because the traffic is easier on that particular day so walking is more healthy), its slightly more relaxing to explore it while looking for houses which hasn’t been modified yet, also try Kemayoran they have some good colonial mansions as well. According to some source there is still 1200 Dutch house standing scattered throughout the city. If you happen to visit Bandung, Surabaya or Malang you will see tonnes of these houses… more than Jakarta i presume from what i’ve seen. If you explore in depth the small streets and alleyways of Bubutan in Surabaya, they have some of the earliest Dutch architecture in the city. I haven’t been to Semarang so i can’t comment much, but i pressume there is still a lot of alleyways with houses dating back to VOC era, yet unknown to the society of its importance and are under constant threat of being lost. Bandung probably have one of the best residential colonial district, the modern Art deco applied in the beautiful houses is totally must see! 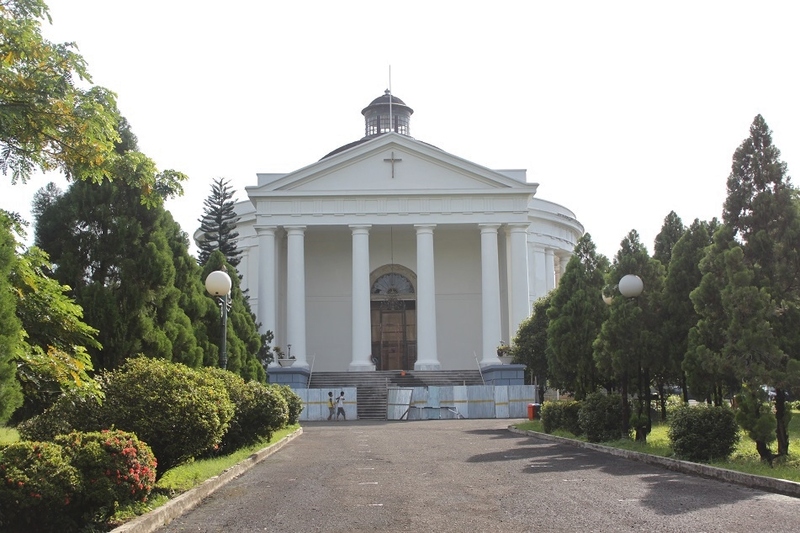 As for Bandung, I used to live there for five years, and during my last visit a month ago I went to some colonial buildings that I had yet to see during those five years. I’ve only been to Malang once, but even from that short visit I was really impressed by the wealth of Dutch colonial buildings scattered all over the city. I would love to come back soon to explore more. Thanks again for your extensive suggestions! I really appreciate it. Sure no problem 🙂 the thing is, if no one knows or recognize these houses and where it is, then who will? too many houses and old buildings around these area has been either toppled or changed… I’ve been sending messages to Pemprov about protecting these old buildings for ages, with very little response, atleast it appear Ahok is interested in helping these old buildings from extinction. Often money is the biggest issue in old buildings preservation. It’s either the government doesn’t have enough money to do so, or some private investors are willing to spend a huge amount of money to tear those buildings down and replace them with shopping centers. I read once that Ahok wanted to find a solution for these issues by asking private investors to manage the old buildings and turn them into restaurants or any kind of commercial places without having to alter their physical appearance. The government, in return, will provide good access to transportation. Pingback: Toraja: Where Life Revolves around Death | What an Amazing World!